An excellent drum machine that combines real analogue sound with modern features. New sounds added to the original 606 palette. Not a 100% soundalike of the original, though very close in places. Mythology has always played a massive part in music making, be it bluesman Robert Johnson selling his soul to the devil in return for musical skill, or the magical timbre and timing of an 808 drum machine, the allure remains. In music technology terms, this often means ever-inflating prices on the secondhand market, even for kit that is severely limited in functional terms, and that presents an opportunity for anyone willing to create a reliable, cheaper, and often even more featureful remake. Step forward, Cyclone Analogic! The French company gathered much attention - and some infamy - a few years back, with the introduction of the TT-303 BassBot, which looked identical to the original 303 and added new features. The TT-303 also sounded very good, claiming to be an exact circuit clone of original (albeit employing modern Surface Mount equivalents of the original components). It is within this context that Cyclone has introduced its promised TR-606 clone, alongside one of the even-more-retro CR-78. 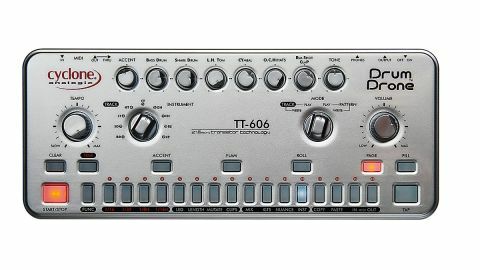 Today we’re looking at the company’s take on the TR-606, the TT-606. Whether due to legal action or a quest for design originality, the copying of the box’s original styling has been largely laid to rest - though the knobs and name font still tip a nod to the 303/606 family. The back panel has full-sized MIDI ports, with the output switchable to act as Thru port if required. Unlike some other recent units, no USB interfacing is included. However, the MIDI implementation is comprehensive, providing full parameter automation, transmission and reception, as well as the expected note-on/off and clocking. Firmware and pattern backup are also achieved via the ever-dependable DIN ports. On the rear you’ll also find the main mono, headphone and individual sound outputs. Tapping into one of the seven instrument mini-jacks will remove the associated sound from the main mix. The larger front panel knobs take care of Tempo, Volume and programming, whilst the smaller knobs control accent and instrument levels alongside a mysterious parameter labelled Tone. It is the latter of these that gives some indication of this unit being far more flexible then they first appear. Each instrument (or ‘sound’) has one editable parameter which directly adjusts the circuitry of the underlying sound engine. For many sounds, this provides access to pitch or decay, although TT-606 Cymbal has both (by using the Function key). The Snares have adjustable ‘Snap’, and some sounds also provide a range of starting timbres. The Tone knob is used to adjust other parameters, so caution is required at times. Snapshots of tweaked kits can be saved in one of 32 Kit locations, accessed separately from Patterns and Clips. Programming is based around the classic grid-based x0x system of Patterns (64 each with a Fill variant) and Tracks, with the option of real-time (Tap) recording. The Mode switch changes from playing to Writing (recording) without having to stop playback. The ability of the 16 backlit step buttons to display different colours means that introducing other tweaks such Accents, Flams and Rolls is pretty straightforward: Accents can be added per-instrument or on a global basis, as was the case for some older machines. In Play mode, step-based tweaks such as Rolls can be used as live performance tweaks in real time without altering the original patterns. Rhythm patterns for individual instruments can also be stored as Clips (16 per instrument) ready for use in patterns at a later stage - a useful tool when compiling patterns for a complete track. Further inspiration can be found in the Mutate function that subtly alters existing steps for the chosen instrument. One feature not found on classic analogue drum machines is parameter automation. This Cyclone machine takes this concept and provides a way of altering the Tone control for each Instrument automatically, based on a series of tempo-synced LFOs. This is surprisingly effective, and very easy to apply. Subtle timbre variations really add life to patterns, though utter mayhem is also possible if that’s your thing. No owner of an original will claim that this box sounds exactly like the real thing - our 606 is noticeably different in places. However, it still maintains that all-important analogue vibe. More importantly, the range of tones and programming system goes far beyond what the original can do.